Todd Lappin of Telstar Logistics just turned us onto this: Craig Butz created an amazing site illustrating the route the Southern Pacific Railroad once took through the Mission District. Today the tracks are long gone of course, but there are some lasting remnants in the form of diagonally oriented buildings, parking lots and gardens. Did your backyard used to be a rail yard? Link. And who knew there used to be a railroad bridge over Dolores Street!? Here’s a picture of the 25th and Valencia station in 1906. On the map, notice how wide the path is in some places — the train ran on top of a 20 foot berm through Noe Valley until it came to street level at the Valencia and 25th station. They built the tracks in the 1860s and the city grew around it. 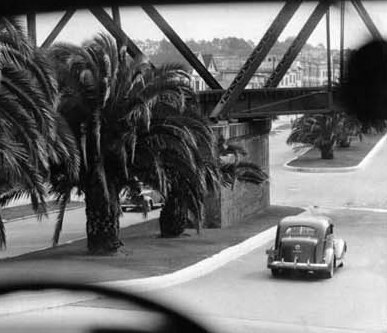 There was a trestle bridge across pretty much every street on the way from 30th and Day to the Valencia station, thus the Dolores bridge. Anyway, it used to be the main line into SF until 1907 when they finished the tracks that Caltrain runs on today through Bayshore. “Our” line dropped to a daily passenger train that ran until 1932. Until 1942 the tracks ran freight and carried coffins from funeral homes in SF down to Colma! Then all the trestles were ripped down and the berms were replaced by houses by the 50s. But damn, I’d love a Caltrain station at 25th and Valencia, bodies or not. They widened it in the 30s, and again in the 50s for 280. I highly recommend the Arcadia Images of America books — they have a bunch on various neighborhoods in SF, some great photos. Great stuff! Actually this whole thing started because I asked Todd if he had any idea what this infrastructural oddity is. It’s located on the corner of Highland and Mission, due east of the bernal/glen park cut. Any ideas? Almost looks like a vent — since it looks like cast iron, I’m wondering if it has something to do with the city’s high pressure auxilliary water supply system, or for one of the emergency cisterns that are under a lot of intersections. If you have a library card, you can get access to the old Sanborn insurance maps. It shows what I *think* is a cistern under that intersection, and something labelled ‘VAC’ on the corner of our I.O. Vacuum maybe? This is all complete guesswork on my part. Maybe someone in the SFFD who’s reading can confirm… Regardless, the Sanborn maps are cool as hell.